In the high latitudes where Susanna J. Mishler has trained her eye and temperament, sunlight is precious and absolute. Its winter absence, its summer return, the very increments of solstice and equinox are far more sharply drawn than in our milder, vaguer climates. We feel its northern brilliance in her every line. In one of the poems in this magical volume, ‘A welder’s / hammer strikes on slag and uncovers / a bright new seam,’ which might serve very well as a figure for Mishler’s own poetic achievement. She works with a bold instrument; she pays meticulous attention to the elements of a ravishing, damaged, stern-but-fragile world; she uncovers real beauty in the linkages. And makes real beauty too. It’s easy to forget that gentleness is its own form of brilliance, but this lesson abounds in Susanna J. Mishler’s welcome debut. Well, ‘lesson’ is too rigid a word. In Termination Dust, we return to the poetic line as that unit that takes measure of the human heart even as it reaches into the margin’s icy blank. This lyric measure, this ethic of Mishler’s line, doesn’t treat of the human condition as if it is symptomatic of error and in need of cure. It celebrates the mild fever her poetry also causes—a heat that eases thought and opens it so that thought again becomes feeling’s necessary home. 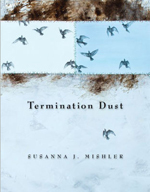 Mishler’s poems, each one of them in their fine craft, do this work: her lines capture those moments we have let go astray—somehow like a child who is lost without knowing he is lost—and coaxes them back into meaning. It is subtle work, often humorous, always necessary, this reminder—every line’s bright and gentle hint, that it matters, all of it, life and those living it. Susanna J. Mishler's poems have appeared in numerous journals, such as The Iowa Review, Mid-American Review, and Kenyon Review Online. She holds an MFA in Poetry from The University of Arizona in Tucson, where she served as a poetry editor for Sonora Review. She's the recipient of a Peter Taylor Fellowship in Poetry at the Kenyon Review Writers' Workshop. Susanna is a founder and curator of the Synergies Live Reading and Performance Series in her hometown of Anchorage, Alaska. In addition to her literary pursuits, Susanna works as an electrician.